It’s rare to come up with a new idea. Basically, we reinvent the wheel or are inspired by the works of others. Taking the content of others and building upon it is one way to inspire creativity. Our students already do this and we need to support them in proper attribution and learning about Creative Commons. Mission 4 in my book, Hacking Digital Learning Strategies: 10 Ways to Launch EdTech Missions introduces students to attribution and Creative Commons (CC). 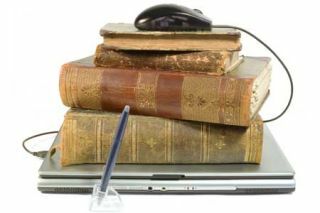 Students investigate the licenses of CC licensed audio, images, and video in order to complete the mission to create a chapter in their own digital textbook. Attribution and remixing the work of others was also the topic of today’s #EdtechMissions chat. Anthippi Harou (@AnthippiHarou) and Jane Lofton (@Jane_librarian) contributed most of the resources in the archive.. Find the archive of the chat below with their tips and insights. I invite you to join us on Sunday, Nov. 19th with special guest Anthippi Harou, a primary teacher in Greece, who will share her experience with Global Collaboration Projects. We meet at 10amET (3pmUTC) to 10:30amET (3:30pmUTC) (click for more time zones). If you are new to Twitter chats then check out, A Quick Start Guide to Participating in a Twitter Chat.